Interior design made for outdoor living. Garden Living outdoor kitchens are designed and engineered to withstand the harshest of climates in the GTA, and all across Canada. Garden Living outdoor kitchens come completely rust-proof, unlike metal or stainless steel. All of our panels provide excellent durability and do not scratch or dent like metal cabinetry. Our kitchens exhibit excellent load strength, commercial grade framing system ensures your Garden Living outdoor kitchen is built to last. Our unique framing system always makes sure that your outdoor kitchen stays just as square and plumb as the day it was installed. Highly engineered paneling and counter-top surfaces. Our kitchens are also completely rot and mildew proof, and use UV inhibitors to prevent sun damage or fading, so it looks great year after year. Whether its stainless or matching cladding; all Garden Living Kitchens come outfitted with toe-kicks to create a truly polished top to bottom look. Our snap-on, snap-off paneling means that you can replace cladding panels, framing, and shelving with ease using only simple handtools. If a part fails or gets damaged, we can cut an exact replica using CNC processes. Channels for Gas & Electrical. Our simple snap-on, snap-off panels allow for instant access, whether servicing or installing gas fittings, electrical and other A/V systems. Run your cables through our unique framing system for proper out of the way cable management. 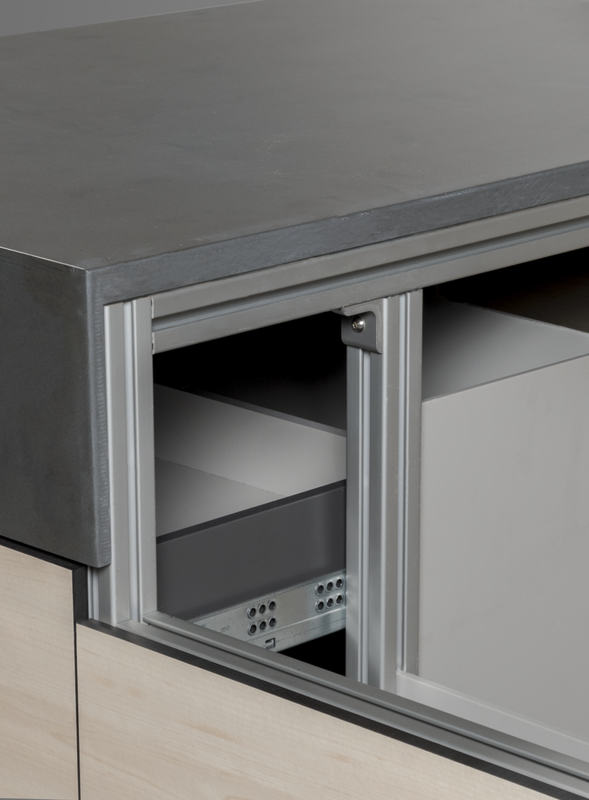 Our outdoor kitchens feature built in level adjustable feet system, which will not rust. No Laminates or Edge Banding. Nothing to fray, pull away or de-laminate. Using our feet leveling system helps keep every Garden Living kitchen elevated off the ground to allow for proper ventilation. To avoid rot and mildew build up, our kitchens have a built in drainage system allowing water to properly drain out and avoid settling. All Garden Living outdoor kitchens are made with a low carbon footprint in mind. By using knocked-down shipping and packaging, our kitchens ship with a smaller dimension, minimizing transport Co2 emissions. We are also able to maximize efficiency in precision cutting using CNC, reducing overall excess waste of cut materials, contributing to an overall lower carbon footprint.